Disclosure: This review contains affiliate links. Learn more about how we review products here. It’s late at night, you’re lying in bed and you hear the distinct and unwelcome sound of a creaking floorboard from outside your room. There’s only one thing for it. Grip the blanket, pull it up to your chin and keep quiet. You’re safe now. Some motorcycle riders have the same misguided belief that token deterrents will prevent their beloved machines from being stolen. They visualize would-be thieves standing in resignation with hand on hips at the sight of the small contraption you have placed around a wheel or brake lever. No one device will prevent outright theft. 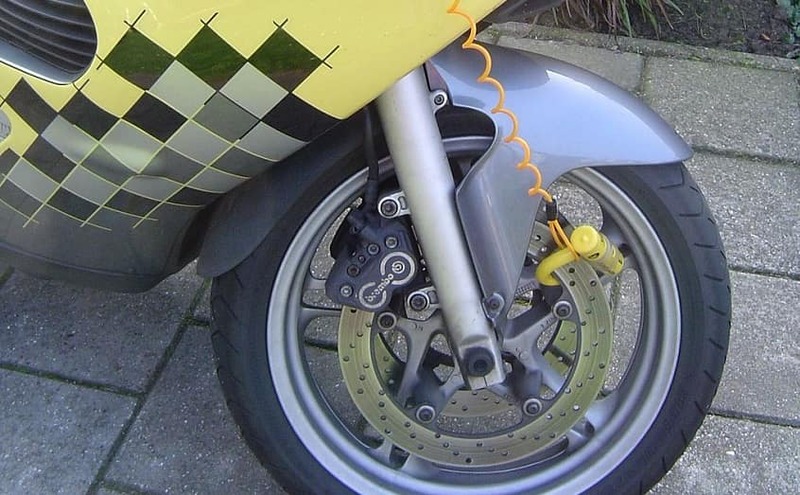 With that in mind, slowing down a criminal may be enough to send him on to the next bike which is where a good deterrent or security accessory comes into its own. As every scuba diver knows, you don’t have to outswim a shark… just your dive buddy. All of the models reviewed here have redeemable features across a wide budget range. I would choose something cheap, quick and easy to fit, complimented by something more substantial for overnight or lengthy parking durations. The JDC Jaws disc lock alarm is strong, quick to attach and has an alarm. That would be my choice for public parking for short to medium durations. 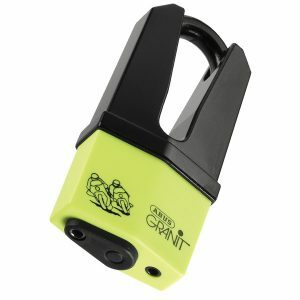 The ABUS Granit Disc Lock would be my preference for strength. With an 11mm steel low profile bolt and a tough casing it should withstand all but the most determined and well-equipped thief. Disc locks are an excellent security tool. A good quality model correctly placed, lessens the chance of your bike being wheeled away quickly. An in-built, attention drawing, audible alarm further enhances its deterrent characteristics. 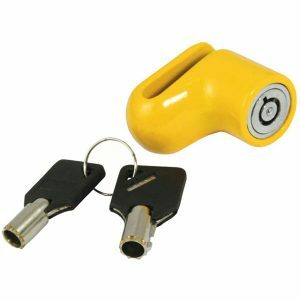 Disc locks are usually quick and easy to attach, can be stored in small places and won’t cost you a small fortune. They may compliment other security devices such as chains and ground anchors providing a miniature ‘security field’. Riders generally fit a disc lock to the front or back disc but doubling up isn’t uncommon. It is important to know the width of the holes in your discs to ensure that the locking bolt will fit them. You also need to remember that you did fit them as riding away with a lock still in place won’t get you very far and will damage your bike. The best way to prevent this happening is to install a memory cable. 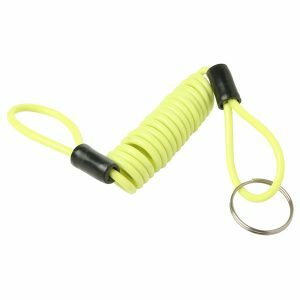 Total no-brainer – extremely cheap and will stop you looking like a numpty! Security devices often come with two to five keys. Like your ignition keys you should give some thought to where you keep them. The aim is to avoid inconvenience if you forget one, but also to avoid the chance discovery of a spare and risking the theft of your bike. Hiding one on your bike shortens the distance but don’t make it obvious… some thieves are clever; their ‘job’ requires it. Insurance premiums can be cheaper when owners invest in and use approved security devices. 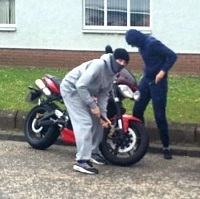 Motorcycle thefts have increased dramatically in the last year with £3 million worth of bikes stolen every month. That’s a lot of thieves. How well protected from them is your bike? Steel is the metal of choice when going one-on-one with bike thief. The casing is also a potential weak link and should be considered. Hardened steel has an advantage over more brittle metals and is not as easily shattered by heavy duty hammers or cutters. Models with alarms incorporate motion detectors and audible alerts up to 120 decibels, more than enough to give a would-be thief an earful. Let’s have a look at some of the popular brands and models available. The distinctive feature of the ABUS Granit disc lock is its very short recessed shackle. 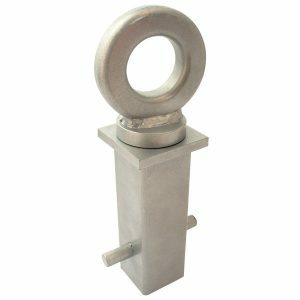 With enough to fit through the disc the hardened steel 11mm locking bolt leaves very little surface area for a thief to access and cut through. A small shield covers the key insert hole to prevent ingress of dirt and grease and a memory cable reminds the rider the lock is in place. If weight is an indication of quality then the heavy ABUS Granit disc lock should provide formidable resistance to the sturdiest of cutters. The JDC Jaws lock is a lot of product for your money. This very affordable device includes a 110 decibel alarm siren. It is water and weatherproof and comes with a 7mm pushdown locking pin. The alarm is not super-sensitive where even a passing mosquito will activate it but realistically set to alert bystanders to slight touch or movement. The low profile bolt makes it very difficult to attack with cutters. Its affordable price allows two devices to be fitted further slowing down the criminal and drawing attention to any burglary attempts. 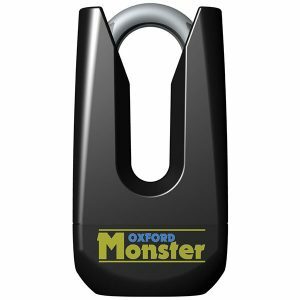 Oxford’s Monster Disc lock is made of Ni Cr Mo alloy steel and is Thatcham Approved. It comes with three keys and a lanyard to remind you that the device is still attached to your disc. The shackle has a width of 11mm and the whole device stores neatly into a smart pocket pouch. Double locking mechanism with 2 hardened steel bolts. Despite the strong metal components of the lock the casing may be vulnerable to heavy duty or advanced cutting tools. A little more expensive than other models. The Mammoth Micro Disc Lock is tiny and retailing at a single figure sum represents the most basic of our selection of disc locks. However, don’t be fooled. As long as you know its limitations then it can be used very practically in a number of scenarios. Intended for short-term use as a minor deterrent the device may be ideal for a quick visit to a shop. However, buy a winning lottery ticket while you’re in there as you’ll need all the cash you can get if you rely on this as your sole means of theft prevention. Its 6mm hardened steel pin is small compared to other models but is very well hidden inside the casing. Lightweight, compact and fits easily into pockets. Very cheap allowing you to purchase several for multi-placement. Unsuitable for protection against heavy attacks. Unlikely to win favour with insurance companies. 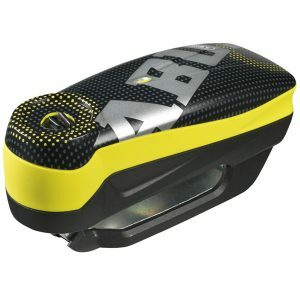 The German security company, ABUS, is the manufacturer of this handy, compact and secure disc lock device. The slightest movement will activate its noisy alarm. The on-duty detection system is indicated by an LED which flashes every 6 seconds. There are different audible and visual signals for the functional status of the device. These functions include battery status and detection system activation. The Detecto’s patented Snap’n Go System allows one handed operation; convenient when carrying your crash helmet or smart phone. Step back and think like a thief. Is the next bike an easier option? This will help you match the level of risk with a suitable device. If a disc lock is going to be your primary choice of security deterrent then opt for something strong, with a recessed bolt and a built-in alarm system. Fixing two not only makes theft a longer process but a painful and riskier one as two bursts of 100 plus decibels ring out for several minutes. 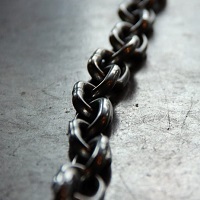 Consider ‘security fields’ where chains, locks and alarms are used in tandem. It may take longer to implement but the downside is a long walk home and higher premiums. Thieves don’t like being seen or heard and less still… locked up. Make their job as difficult and conspicuous as possible. Safe and happy riding to all.